As best as I can remember, the first time that I really noticed glass was at four or five years old, at my grandmother's house in Queens, New York. The sunlight filtering through a low window caught my eye with a brilliant blue glint through a small cobalt glass bottle. My grandmother held it up to the light for me and I was enchanted; transported into a realm of exquisite pure color. Little did I know that the spell cast on me at such a young age had been cast on Egyptian pharaohs of the eighteenth dynasty and on Persian princesses, two thousands years ago, by their cobalt glass jewelry. In all three cases, the deep rich blue of cobalt oxide glass was responsible. Today, the source of ancient Middle Eastern cobalt is unknown, possibly West Africa, but more recently, in the Renaissance; it was mined in Hungary, in Bohemia and in German Saxony, where it was called "zaffer," after its sapphire color. Legend tells that sixteenth century silver miners in Germany amassed a hoard of smaltite thinking it was silver ore. When they tried to smelt it, the arsenic which cobalt ores always have, evolved highly toxic fumes that made them sick. Discouraged and maligned, they said the product of their labors was cursed by goblins; they named it "kobald" (cobalt) after the evil spirits. The theme of 'evil spirits' (toxic fumes) was common in mining circles. A mythology persisted from ancient times up until the eighteenth century that divided the spirits into two groups; mischievous, and malevolent. The mischievous spirits played tricks on the miner's perception and equipment, the malevolent spirits could stop a man dead in his tracks, literally. Regardless of the difficulties both terestrial and otherwise, a strong market developed for the newly found "kobald" among artists for paint, potters for glazes, and glassmakers. The Saxon miners gained a reputation for producing the finest zaffer. 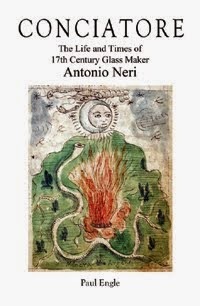 In his glassmaking book L'Arte Vetraria, Antonio Neri describes his method for purifying and preparing zaffer for use in glass. It is a recipe that would stand the test of time, still quoted by authors into the nineteenth and twentieth century. You should get zaffer in large pieces and put it in earthenware oven-pans holding it in the furnace chamber for half a day. Then put it into iron ladles to inflame it in the furnace. Heat it well, then take and sprinkle it with strong vinegar. When cold, grind it finely over a porphyry stone into glazed earthen pots with hot water. Then wash more water over it always leaving the zaffer to settle in the bottom. Now gently decant, to carry away the sediment and impurities of the zaffer. The good part and pigment of the zaffer will remain in the bottom. The pigment remains are now prepared and purified to be far better than it was at first, which will make clear and limpid pigment. This zaffer should be dried and kept in sealed vessels for use, which will be much improved over the original. Until the mid 1700s zaffer had been associated with silver and copper mines, and was commonly thought to be a derivative of copper. 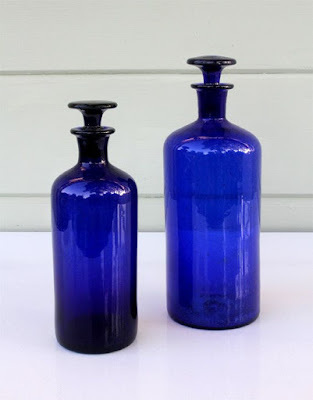 It was Swedish chemist Georg Brandt who finally isolated the new metal, and gave it the name which honors the miners and the subterranean spirits which still can cast a spell on us through its deep pure blue color in glass. * This post first appeared here in a slightly different form on 4 April 2014.